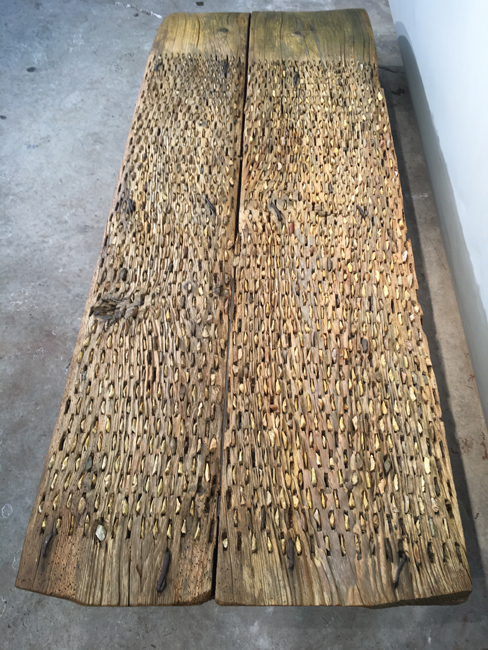 A tribulum is an ancient hand-made threshing board, inlaid with chips of flint or stone, that has been used since Roman times to separate grains from the chaff. We were fortunate enough to score two of these coffee tables, this one in a lovely honey brown color, and the other in a driftwood grey, each with four contemporary black steel legs. Each is unique and hand-made and we adore the unusual form with one downward sloping wooden end and the main part of the table inlaid with small stones. While they are stunning as is, you can have glass tops cut to cover the stone-laden area for a smooth top, or use as is with a large tray for serving drinks. One tribulum form, once common in Mediterranean countries, was about three to four feet wide and six feet deep (these dimensions often vary, however), consisting of two or three wooden planks assembled to one another, of more than four inches wide, in which several hard and cutting flints crammed into the bottom part pull along over the grains. In the rear part there is a large ring nailed, that is used to tie the rope that pulls it and to which two horses are usually harnessed; and a person, sitting on the threshing board, drives it in circles over the cereal that is spread on the threshing floor. Should the person need more weight, he need only put some big stones over it.